half the sugar, the butter and grated rind of lemon, and put into milk and rice. The whites of the eggs, the remainder of the sugar, the juice of the lemon, and put over the top of the pudding. Sweet Apple Pudding. 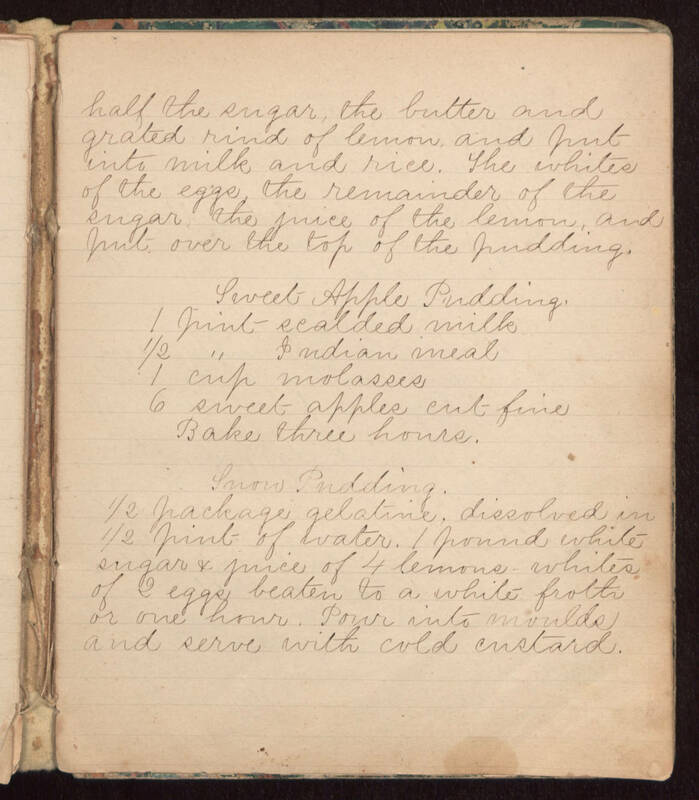 1 pint scalded milk 1/2 " Indian meal 1 cup molasses 6 sweet apples cut fine Bake three hours. Snow Pudding. 1/2 package gelatine, dissolved in 1/2 pint of water. 1 pound white sugar & juice of 4 lemons - whites of 2 eggs beaten to a white froth or one hour. Pour into moulds and serve with cold custard.